The aggressively peated cigar for the aficionado who loves Scotch. Peat is harvested, or cut as the Scottish say, by hand using the same tools that have been employed for hundreds of years. The resulting sod is left to dry in the open air for approximately two weeks. The dried peat is carefully packaged and placed into a shipping container. The container is then loaded onto a ship and vectored directly to the Dominican Republic. In developing the peat firing process we exchanged the traditional hardwood used in fire-curing with peat imported from Scotland. The resulting heat and smoke produced by burning the peat delivers phenols that are absorbed directly into the tobacco leaf. These phenols deliver the peat flavor without harming the natural characteristics of the tobacco. The peat fired tobacco is then aged for 60 days prior to moving to the blending and rolling phase. Meticulous care and analysis is taken during the blending of each Caleanoch cigar. The master blender ensures the exact proportion of peat and air-cured tobacco is organized for the roller in order to construct each Caleanoch to its specific strength specification. 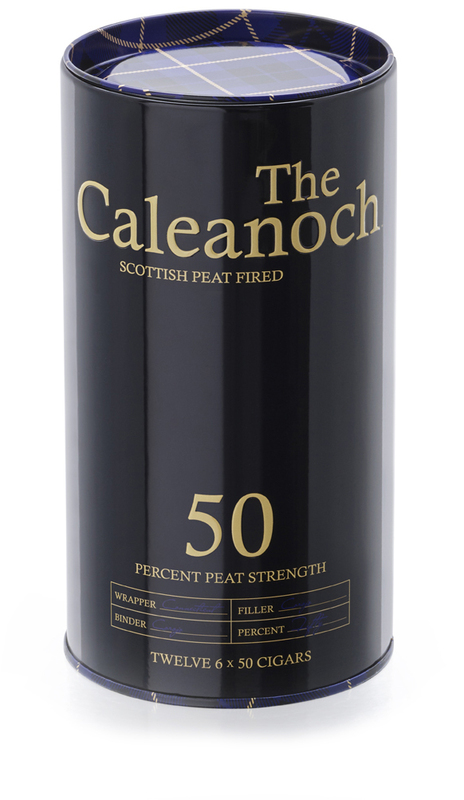 For Caleanoch 50 the blender ensures 50% of the Tobacco in the filler is peat fired. Upon receipt of the aforementioned tobaccos from the master blender, the roller constructs each Caleanoch by hand. Careful to layer the peat fired tobacco evenly throughout the filler to ensure each puff delivers the acclaimed Scottish flavor. On the seemingly endless quest for something different. Something unique but will never get old. Something new but nostalgic. The Caleanoch is the only cigar in the world dispensed from a custom decanter.